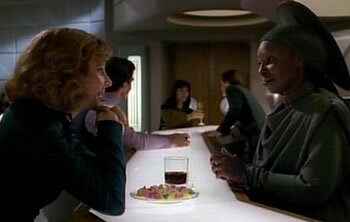 Synthehol is a science-fictional substitute for alcohol that appears on the Star Trek:The Next Generation television series. It allows drinkers to experience all of the enjoyable, intoxicating effects of alcohol without unpleasant side-effects like hang-overs. Professor David Nutt, a psychopharmacologist at the University of Bristol in the UK, believes that there is no scientific reason why it cannot be created now. Alcohol works in the brain mainly by latching onto signalling molecules called GABA-A receptors. There are dozens of subtypes of these; not all of them are associated with specific effects of alcohol. For example, memory loss may occur in conjuction with drinking because alcohol binds to alpha-5, a GABA-A receptor subtype in the hippocampus. Professor Nutt suggests that if molecules that bind poorly to the bad subtypes like alpha-5 could be developed, it would be possible to retain the pleasant effects of alcohol without the bad side-effects. Some "partial agonists" of GABA-A receptors already exist; bretazenil and pagoclone were developed as anti-anxiety drugs. These drug molecules are instantly reversible by the flumazenil, used as an antidote to overdoses of tranquillisers. Another element of the "synthehol" alcohol substitute would be an NMDA antagonist such as dizoclipine, originally developed as a drug for stroke. Alcohol inhibits NMDA receptors, which are part of a general excitatory signalling circuit. Perhaps most interesting is the idea that problems like cirrhosis of the liver could be eliminated by altering the composition of alcoholic beverages. Professor Nutt will be publishing this idea in the Journal of Psychopharmacology next month. Science-fictional-beverage enthusiasts should take a look at Programmable Soda, an amazing prediction by UK sf writer Jeff Noon. Roboticists with an interest in alcohol should read Methanol-Powered Robot Muscles - Bend It Like Bender. For the science part, read All the pleasures of alcohol, with no downsides; for the sf part, read more about synthehol. Thanks to Greg for providing the story tip and the sf reference.